Any vacation with kids is likely to include some time spent on playgrounds. Hence the name “family trip.” Fair is fair, and you can’t really ask a five year old to follow an adult-centric itinerary crammed full of museums, historical landmarks and leisurely lunches. In heavy doses, much of the culture will be lost on them, and their boredom will translate into understandable whining that will, in turn, ruin said adult-centric itinerary. In my experience, it is advisable to toss in a playground at least twice a day on a city visit, and you should be prepared to stop again if you pass one along the way. 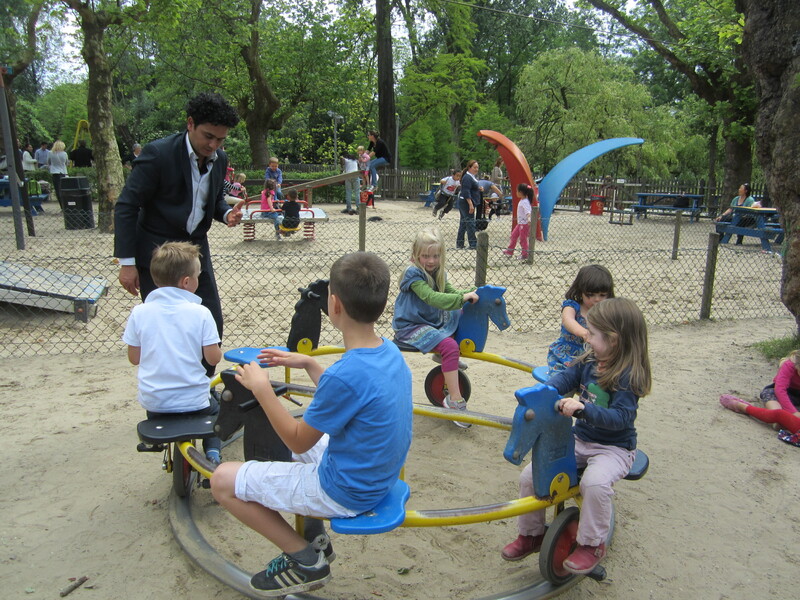 In addition to being a very useful bone to throw at a child weary of sightseeing (we all like to have a say in how our day goes), playgrounds can give them an immersion course in the language, people and culture of your vacation spot. Whether they’re in a different state or a different country, playgrounds can say as much about a place as any public space. Are they graffiti- and litter-ridden? Modern or old-fashioned? Common or few and far between? Filled with locals or tourists? Holland is a very kid-friendly country, and there are big, beautiful parks in most cities, as well as tiny ones tucked into most neighborhoods. As much as my daughter loves playing on them, I love seeing the variety of playgrounds that range from uber-modern to downright antiquated. 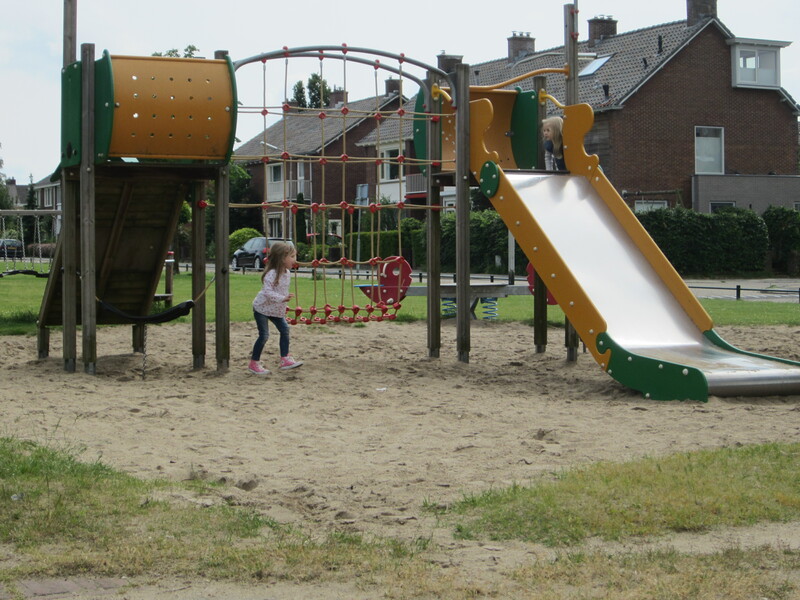 Just as Dutch culture is ever-so-slightly different from American ways, the playgrounds are not wholly dissimilar, but somehow clearly not American. 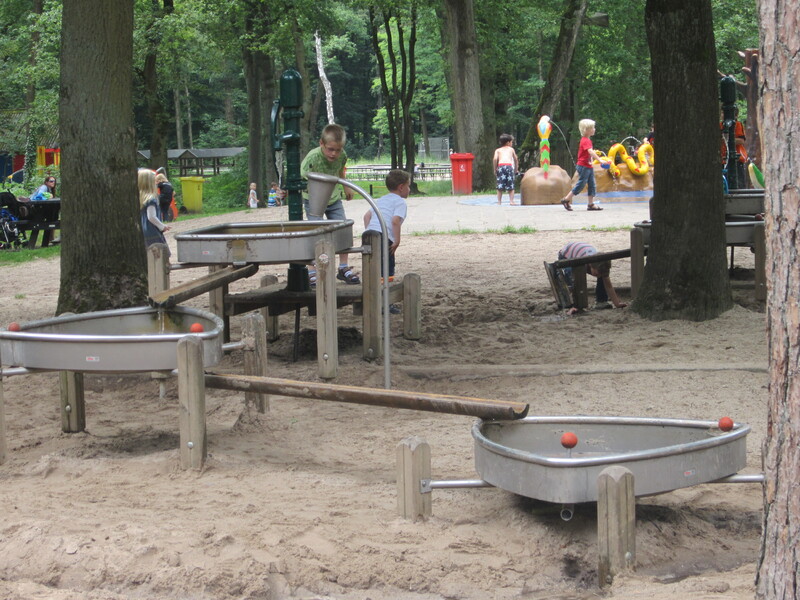 Here is a sampling of playgrounds we enjoyed in Holland. 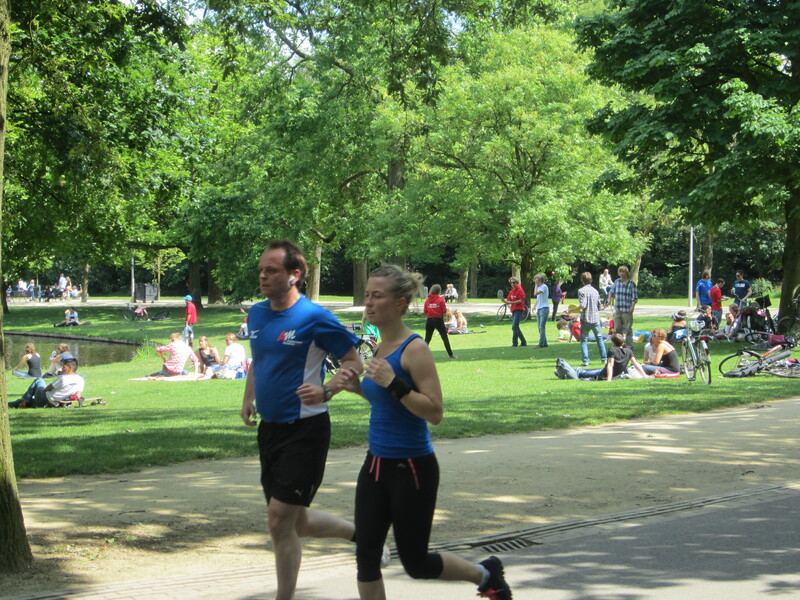 It’s a lovely park, and quintessentially Dutch: filled with art and cafes, manageable on foot or bike, well-maintained, and lush with beautifully planned green spaces. 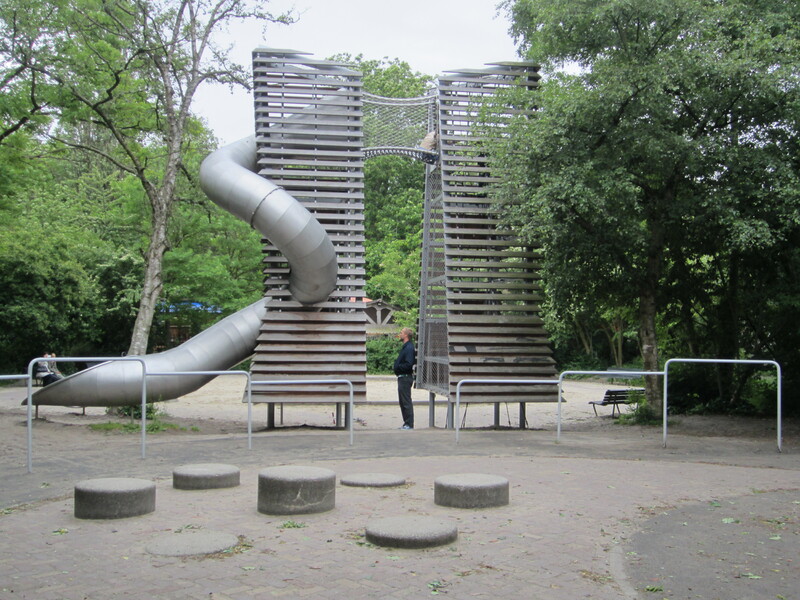 Its playgrounds are just as wonderful, and we visited three of them on a recent visit to see old friends. 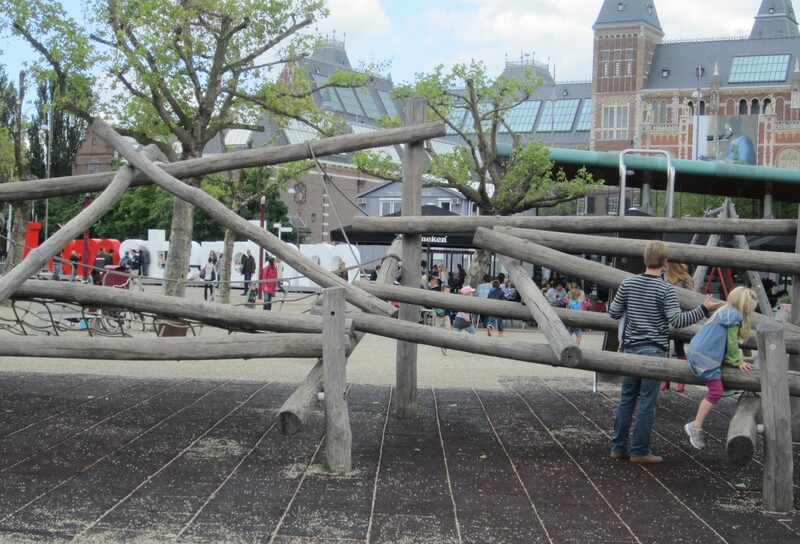 This cool playground merges old and new Dutch design. Aldo Van Eyck designed the play circles on either side of the towers in 1968, and Carve recently added the climbing structure. Proving that fun doesn’t necessarily have to be modern or high-tech, this old school playground at the Groot Melkhuis cafe provided seriously low-tech playground equipment. Stella had to try each and every one, including this pedal-powered merry-go-round. As an aside, the very Euro father in the photo was wearing an ascot and expensive shoes. I should have taken a photo of him helping the kids pedal so they could get some momentum going. 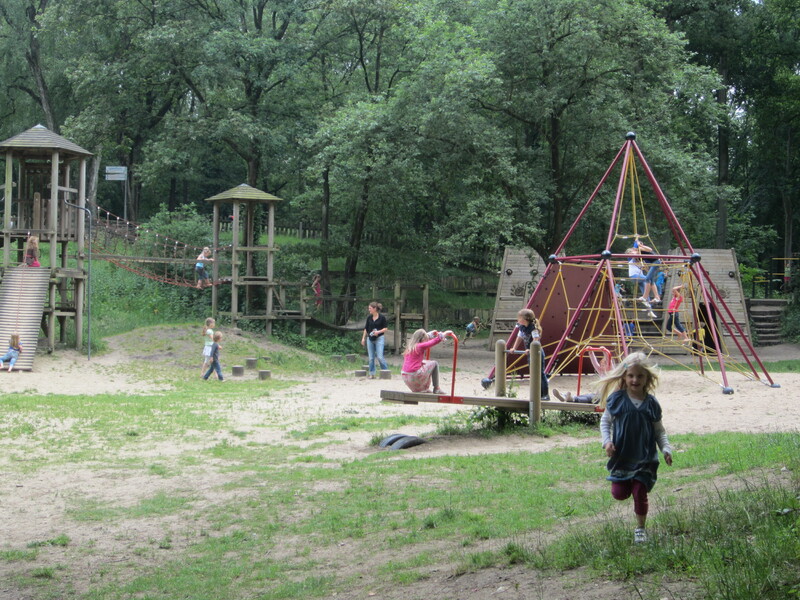 Opened in 1946, this sweet playground in Nijmegen is more proof that low-tech can be more fun. 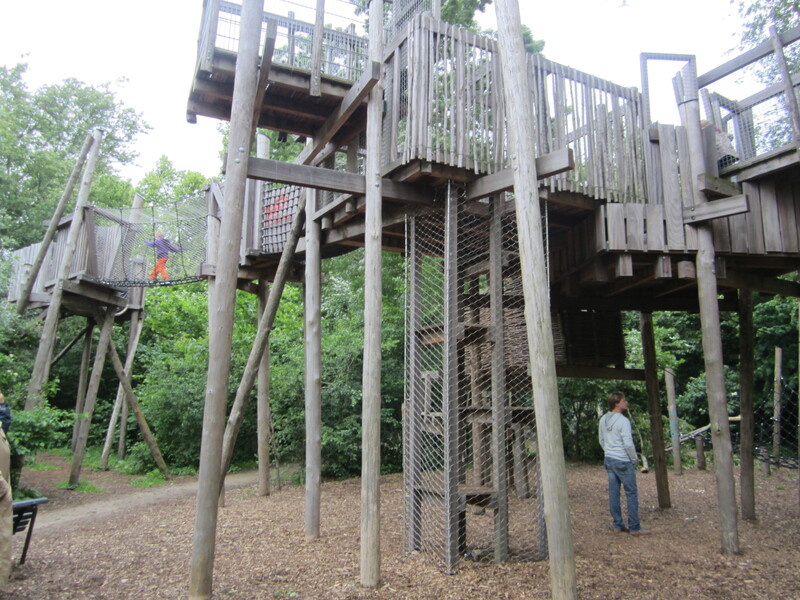 There are numerous climbing structures and other equipment tucked into a pretty wooded area near the German border and, in true Dutch fashion, there’s a cafe where parents can have a cup of coffee while the kids run wild. The one negative about taking your only child to a playground in a country where all the kids speak her second language is that she’ll want to share every single experience with you. All 184 of them. Here she comes now, looking for a see-saw partner. 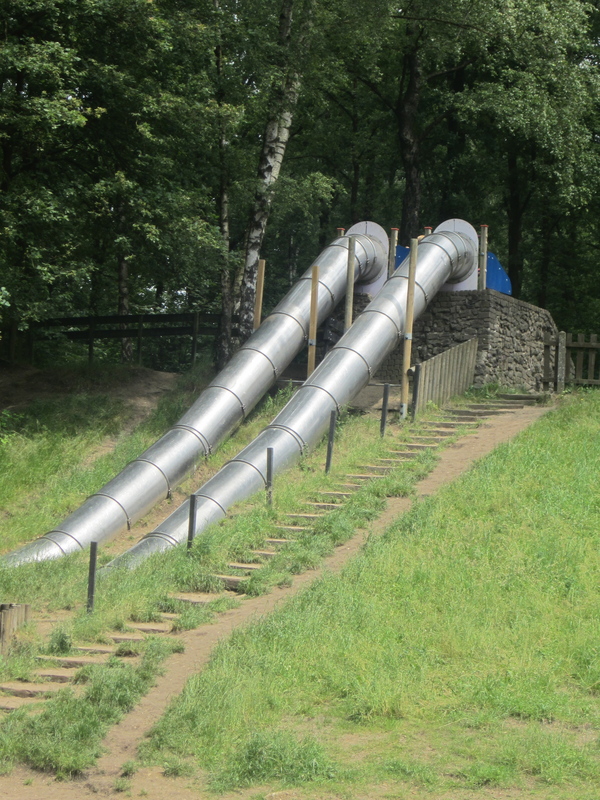 These slides look awesome, but lacked slippery-ness at the bottom, which apparently meant you had to crawl the last five or six feet. This water feature was loads of fun. Five minutes after witnessing a two year old getting completely soaked, I saw her run up to her mother who was drinking coffee with a friend at the cafe. It was clear the mother had no clue how the child could have gotten so soaked. Hilarious. I wanted to take a spin on this hamster wheel myself. So many playgrounds, so little time. 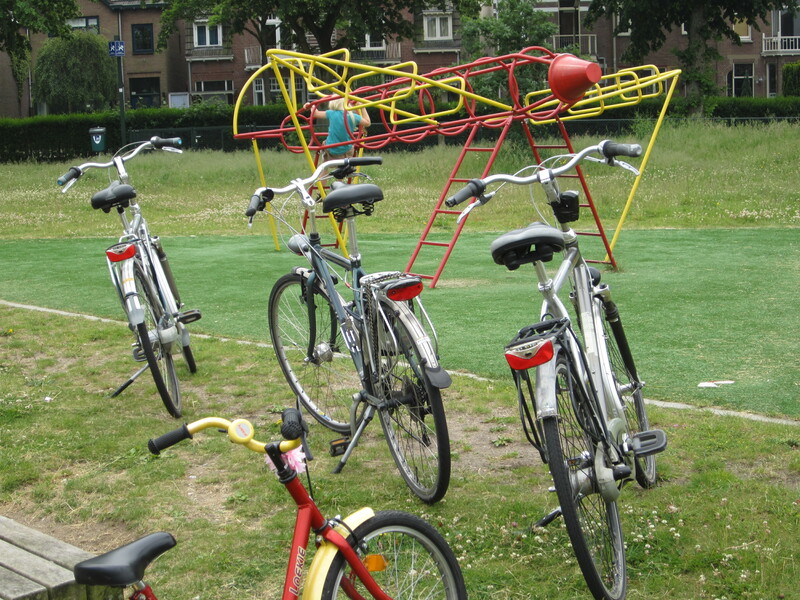 From 5×5 fenced squares containing a lone swing to vast grassy areas with jeu de boules courts and an array of climbing equipment, playgrounds in our home base of Nijmegen were everywhere. Stella loved this weird playground full of airplane-shaped jungle gyms, in part because she learned to ride a bike here! Perhaps no playground is better than the one you get to go to with your cousin. Okay, so a jump house is not a playground. 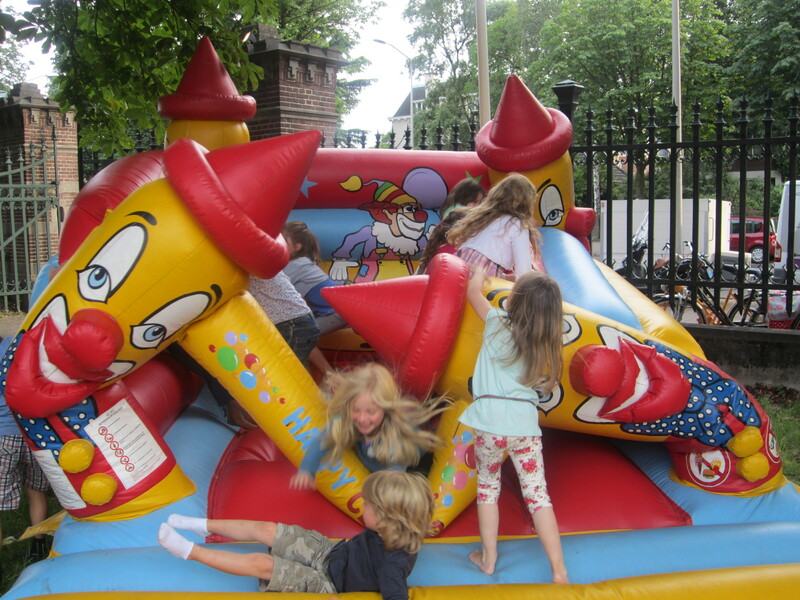 This was the kid entertainment at a festival in front of our favorite cafe. As the children had the bounce house experience of a lifetime, all of us parents stood around, sipping wine, wringing hands and wondering aloud whether it was too dangerous. What is that word for the shirking of responsibility in a group? The bystander effect or something like that? Whatever that word is, we were all engaged in it. 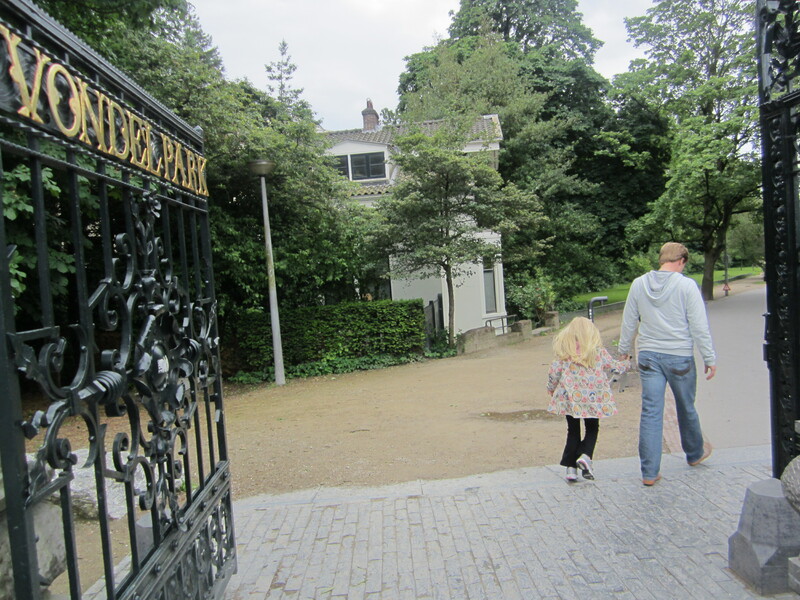 This entry was posted in Family Travel, Parenting and tagged Amsterdam with Kids, dutch culture, Dutch playgrounds, holland amsterdam, Leemkuil, Nijmegen with kids, vacation, Vondelpark by Jill Coody Smits/ little traveling seeds. Bookmark the permalink. Wow, some of those are fabulous play grounds. Having a renewed interest in playgrounds myself I have noticed that we ever vigilent, safety conscious Americans seem to have deemed see-saws and merry-go-rounds unsuitable for our children. I can’t think of the last time I’ve seen either. Sure kids go flying off of the merry-go-rounds but as long as there are no stationary metal structures nearby, how bad can it be? I agree, Amanda! Stella loved all of the old equipment…so different from what we have here. You can only enjoy climbing so many fake plastic rock walls. “Perhaps no playground is better than the one you get to go to with your cousin.” – Fantastic aphorism! Looks like The Netherlands has some excellent parks! Thanks for sharing! Thanks, Ben! 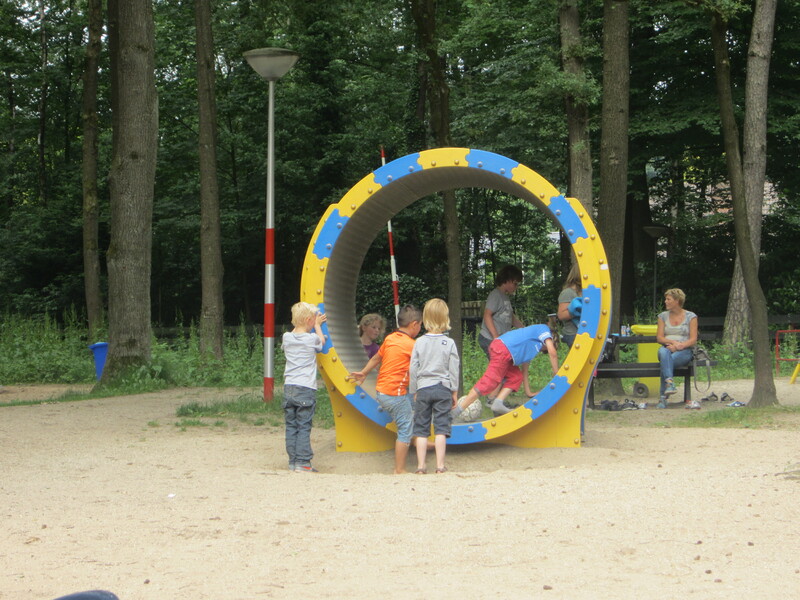 Holland does have terrific parks and playgrounds. I have hundreds more photos–a post for another day! Great article! You make really good points on why finding these playgrounds makes for a better family trip, and the photos were great too!